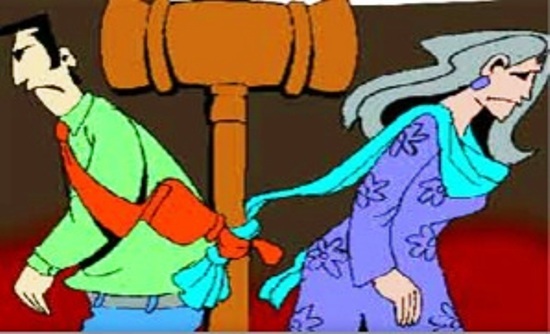 In view of increasing in martial dispute cases has simultaneously increased the divorce cases in the court of laws. The issue has raised a question over the society which is unable to decide as to whether it is boon or bane. There had been mixed response during the random survey by me, to get views about accepting divorce instantly by the court or giving six months time as per provision of the Hindu Marriage Act 1955. Cracking the whip on the quick marriage and quicker divorce culture, the Supreme Court (SC) has said that a couple separated within two days of tying the knot doesn’t have any fundamental right to divorce unless they stay away from each other for six months. The separation period is mandatory under the Hindu Marriage Act 1955. The intervention of Supreme Court is an important judgement of martial dispute case even if there is a mutual consent for getting divorce and there is no scope for rehabilitation, then immediate divorce is possible despite provisions under the Act. In fact, Judicial separation is a sort of a last resort before the actual legal break up of marriage i.e. divorce. The reason for the presence of such a provision under Hindu Marriage Act is the anxiety of the legislature that the tensions and wear and tear of everyday life and the strain of living together do not result in abrupt break – up of a marital relationship. There is no effect of a decree for judicial separation on the subsistence and continuance of the legal relationship of marriage as such between the parties. The effect however is on their co-habitation. Once a decree for judicial separation is passed, a husband or a wife, whosoever has approached the court, is under no obligation to live with his / her spouse . Remarriage or earlier marriage of the husband but solemnized before the commencement of Hindu Marriage Act, 1955, provided the other wife is alive at the time of presentation of petition for judicial separation by the petitioner wife. Solemnization of the petitioner wife’s marriage with the respondent husband before she had attained the age of 15 years provided she had repudiated the marriage on attaining the age of 15 years but before attaining the age of 18 years. It is on all the above grounds that judicial separation can be sought. The first grounds are available to both the husband and the wife but the last four grounds are available only to the wife. It is to be noted that it is on these grounds that divorce is also to be granted. It has been held that unless a case for divorce is made out, the question of granting judicial separation does not arise. Therefore, the Courts while dealing with the applications for judicial separation shall bear in mind the specific grounds raised for grant of relief claimed and insist on strict proof to establish those grounds and shall not grant some relief or the other as a matter of course. Thus on a petition for divorce, the Court has discretion in respect of the grounds for divorce other than those mentioned in section 13 (1A) and also some other grounds to grant restricted relief of judicial separation instead of divorce straightway if it is just having regard to the facts and circumstances. Another question that arises is of decree of maintenance vis-à-vis decree for judicial separation. Where a decree for judicial separation was obtained by the husband against her wife who had deserted him, the wife not being of unchaste character nor her conduct being flagrantly vicious, was the order of alimony made in favour of the wife not interfered with by the Court. While one section of the society – Kulbhushan Gautam, Ashwani Sharama, Ashok Gupta, Inder Singh Gogia, Diwan Chand Sukhija - say that the couple in the event of any family dispute must be given the time to give a second thought for getting divorce especially they are married for number of years and have grown up children. The other category of people – Jatinder Singh, Dr.Mahesh Malethia, Anita Sikri, Pankaj Kumar - are of the view that it is wastage of time and money in litigation for prolonging the divorce in the court of law by giving them a time. While the counseling cell at Women Police Station is already working in the city for the last 17 years with contribution of local citizens by giving sufficient time throughout the week to do counseling of the couples and the success rate is around 80 per cent for uniting them, another committee has also been formed by the District and Sessions Judge as per the directions of the High Court to refer the cases of Section 498-A to give its report before taking any final decision by the court. Section 498-A reads as : Husband or relative of husband of a woman subjecting her to cruelty.—Whoever, being the husband or the relative of the husband of a woman, subjects such woman to cruelty shall be pun­ished with imprisonment for a term which may extend to three years and shall also be liable to fine. When talked to one of the member of Counseling Cell at Women Police Station, S.P.Khera – a retired officer from Life Insurance Corporation of India and President, Petrol Pump Association – who is extending his services for counseling of the couples more than a decade – said, in the event of any dispute, immediate divorce is not the remedy, sufficient time be given to re-think over the instant decision keeping in view the long term consequences especially where the kids are involved. He said, there is a good response for rehabilitation after counseling to the extent of 80 per cent of the referred cases. However, the priority of martial dispute has totally changed and dowry and harassment are at the tail while ego, misunderstanding, extra marital relations, suspicious nature, keeping mobile, addiction, property dispute and interference of parents of both the sides. Judicial separation is an instrument devised under law to afford some time for introspection to both the parties to a troubled marriage. Law allows an opportunity to both the husband and the wife to think about the continuance of their relationship while at the same time directing them to live separate, thus allowing them the much needed space and independence to choose their path. Frankly speaking, until the last two decades, divorce was not at all common in India as it was considered as a social taint, especially for the women. The newer generation is tying the knot of marriage without understanding the true meaning of being committed and responsible for this bonded institution. They are least bothered to solve the petty issues keeping aside the ego for a moment. We have seen the martial dispute cases going on for years together in litigation wasting time and money without any fruitful results. Divorce is boon or bane purely depends upon the circumstances but marriage is meant to last forever till death. In fact the concept of divorce – ‘talaq’- came into practice after Moghuls entered the country and stared influencing the local culture. The divorce has both positive and negative aspects. While it gives a free hand to several women from the sufferings of their marriage and the negative side is the ultimate sufferer are the children. Thus, sociologically it gives rise to a debate. The divorce is both a boon and bane which depends purely on the situation.